SPLENDOR can be used in high speed maintenance programs using battery, electric or propane machines. It also works well with low speed spray buffing using Buff N Clean. 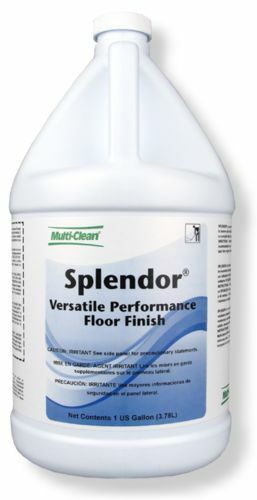 SPLENDOR goes down smooth and easy with no mop drag and levels perfectly. The product dries fast and recoats easily for trouble-free performance time after time. The Number 1 selling Multi-Clean finish. 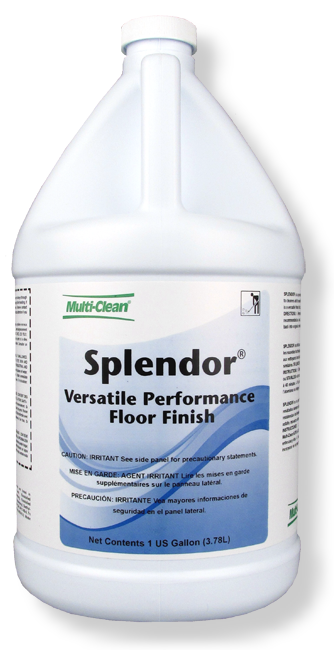 Splendor offers exceptional gloss and clarity in a durable, high wearing finish. Maintenance versatility allows Splendor to be maintained with high speed, ultra high speed and low speed equipment. 19% solids; non-yellowing acrylic co-polymer. Exceptional Durability: Floors Look better . . . Longer. SPLENDOR keeps it shine longer, resists scuffs and black marks, all with less maintenance resulting in savings of time and money. Brilliant Gloss . . . Exceptional Clarity: SPLENDOR produces a high shine with clarity that produces sharp, distinct mirror images. This high shine and clarity produces a more brilliant gloss that enhances a floor’s appearance. Use on all types of resilient tile as well as terrazzo type floors.